Item #MS-715: Approx. 1" sculptured Copper. Michigan's native copper is used to form these interesting sculptures. Molten copper at 2200 °F is poured into straw which is immersed in water resulting in the straw burning away and the new copper corm solidifying in the cool water. Old customs of the early miners indicated that lead was used in the above process and fortune telling was a pastime on New Years day; good or bad luck was determined by the shape and size of the new sculpture formed. 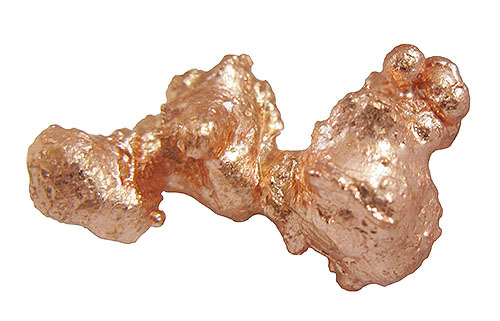 This sculptured copper was proudly manufactured in Michigan's Keweenaw Peninsula.